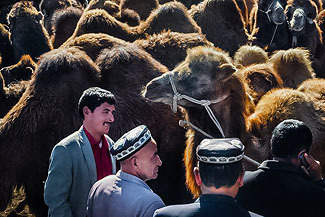 See the famous International Grand Bazaar and Livestock Sunday Bazaar. Enjoy the Pamir Plateau scenery and visit lockal Tajik family. 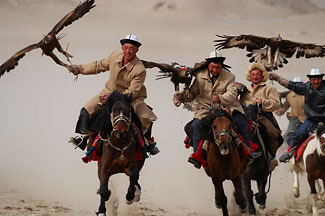 See how the Kyrgyz local huners hunt for the animals by eagles and falcons. 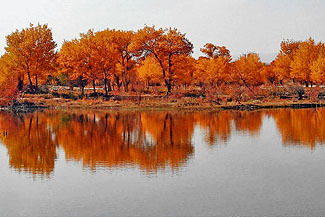 Visit the biggest park in China, the populus euphratica. Drive on the Tarim desert highway, see the vast Taklimakan Desert. 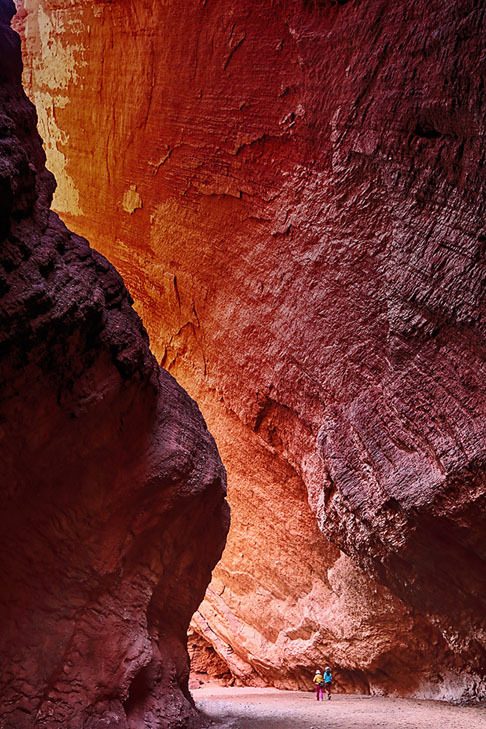 Explore the Tianshan Mysterious Grand Canyon. 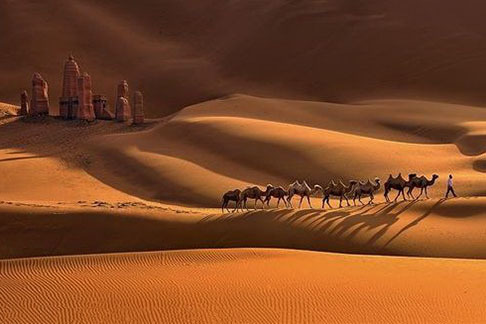 Photo the camel train crossing the desert. 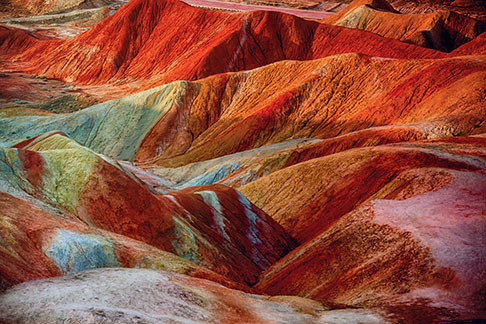 Visit "Painted Hills" in Zhangye Danxia Geology Park (Side trip). Round-trip international airfare from Portland, Oregon, or from Seattle, plus all airfares in China. 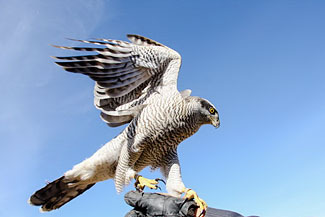 Sightseeing tours by air-conditioned motor coach. Fine meals during the whole trip. Itinerary can be adjusted if photo opportunities appear. 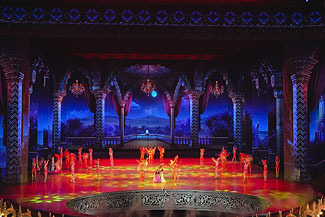 Tour web site: http://www.zhousu.us and click on Tour, 2018 China. Tips not included. We collect tips in advance, to be announced later. 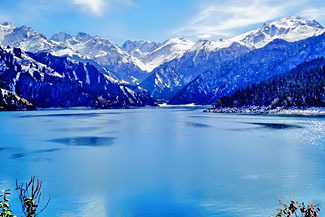 Xinjiang Uyghur Autonomous Region is a provincial-level autonomous region of China in the northwest of the country. It is the largest Chinese administrative division and the eighth largest country subdivision in the world, spanning over 1.6 million km2 (640,000 square miles). 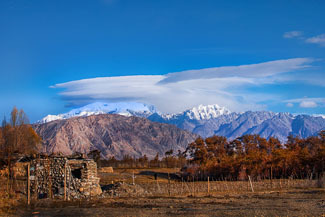 Xinjiang contains the disputed territory of Aksai Chin, which is administered by China. 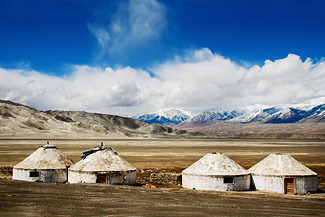 Xinjiang borders the countries of Mongolia, Russia, Kazakhstan, Kyrgyzstan, Tajikistan, Afghanistan, Pakistan and India. 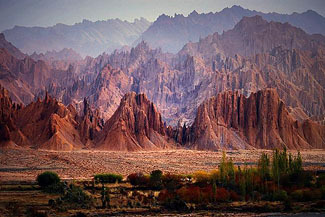 The rugged Karakoram, Kunlun, and Tian Shan mountain ranges occupy much of Xinjiang's borders, as well as its western and southern regions. Xinjiang also borders Tibet Autonomous Region and the provinces of Gansu and Qinghai. 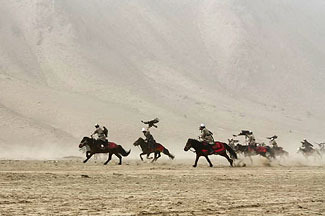 The most well-known route of the historical Silk Road ran through the territory from the east to its northwestern border. In recent decades, abundant oil and mineral reserves have been found in Xinjiang, and it is currently China's largest natural gas-producing region. 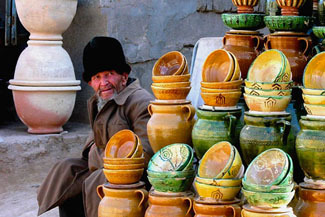 It is home to a number of ethnic groups, including the Uyghur, Kazakhs, Tajiks, Hui, Kyrgyz, Mongols, Han, and Russians. More than a dozen autonomous prefectures and counties for minorities are in Xinjiang. Older English-language reference works often refer to the area as "Chinese Turkestan". 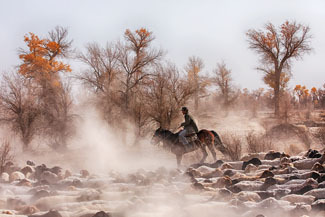 Xinjiang is divided into the Dzungarian Basin in the north and the Tarim Basin in the south by a mountain range. Only about 9.7% of Xinjiang's land area is fit for human habitation. 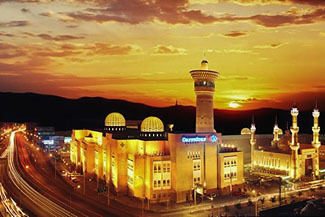 Urumqi is the capItal city of Xinjiang Uyghur autonomous region in northwest China, with a population of 4 million. As home to 49 minority ethnic groups, this graceful prairie city is an important stop along the ancient Silk Road, leading to Central Asia and even as far as Europe. It’s regarded as the farthest city from any ocean in the world. In the middle of Bogda Peak, 68miles east of Urumqi, nestles Heavenly Lake. Covering 1.89 square miles, this crescent-shaped water area deserves its name, Pearl of Heavenly Mountain (Tianshan Mountain). With melted snow as its source, Heavenly Lake enjoys crystal water. 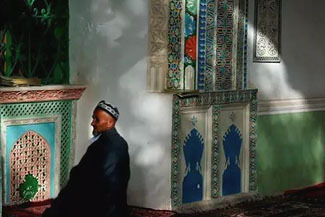 Kashgar is an oasis city in Xinjiang and is the westernmost Chinese city, located near the border with Kyrgyzstan, Tajikistan, Afghanistan, and Pakistan. 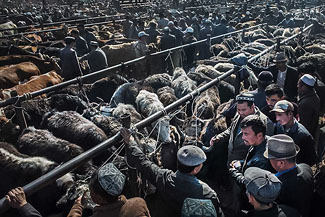 With a population of over 500,000, Kashgar has a rich history of over 2,000 years and served as a trading post and strategically important city on the Silk Road between China, the Middle East, and Europe. Taskurgan means “Stone Tower” in the Turkic languages. Tashkurgan is the seat of Tashkurgan Tajik Autonomous County where is located in the eastern part of the Pamir Plateau. 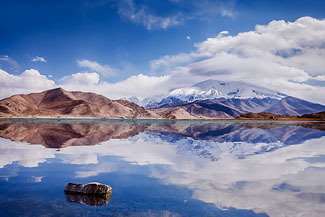 It is situated at an altitude of 10,140 ft on the borders of both Afghanistan and Tajikistan, and close to the border of Kyrgyzstan and Pakistan. 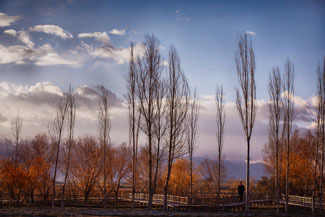 Tashkurgan is a market town for sheep, wool and woolen goods, particularly carpets, and is surrounded by orchards. 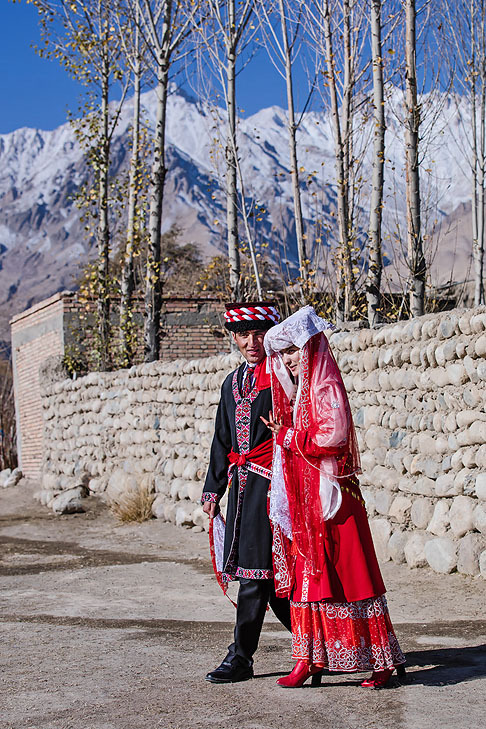 The majority population in the town are ethnic Mountain Tajiks. Today Tashkurgan is on the Karakoram Highway which follows the old Silk Road route from China to Pakistan. 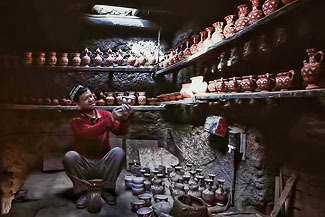 Kuqa (pronounced ku-cheh) is a small and important town along the ancient Silk Road in the Han Dynasty, and it is a largely Uigur population. The fourth-century linguist and scholar Kumarajiva , who came from here, was one of the most famous of all Chinese Buddhists. By the early Tang Dynasty, Kuqa was a major centre of Buddhism in China. Reported the existence of two huge Buddha statues, twenty-seven meters high, guarding its entrances. The city even had its own Indo-European language. With the arrival of Islam in the ninth century, however, this era finally began to draw to a close, and today only a few traces of Kuqa's glorious past remain. 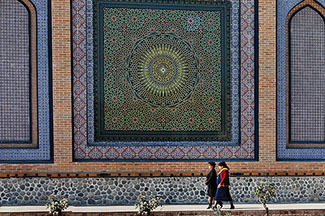 Kuqa Great Mosque: The second largest mosque in Xinjiang. The mosque is believed to be constructed in the 1500s. The adobe architecture was renovated into a wooden structure in 1700s. The mosque is an Islamic-style building with green surface and a dome on the top. The prayer hall is about 1,500sqm and can hold as many as 3,000 persons. Inside the mosque, a ruin of a religious court is visible. 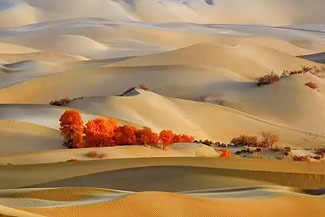 Taklimakan Desert, The Desert in northwest China fills the expansive Tarim Basin between the Kunlun Mountains and the Tibetan Plateau to the south and the Tian Shan (Celestial Mountains) to the north. 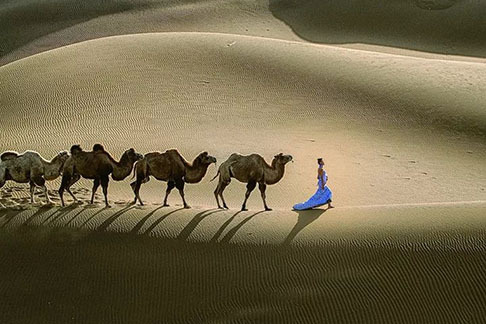 It is china’s largest sand desert and one of the eight biggest deserts in the world. The Taklimakan’s rolling sand dunes stretch out over 3, 376, 000 square kilometers. This desert is located farther from the ocean than almost any other place on Earth. As a result, some parts of the region receive less than 10 millimeters of precipitation a year. 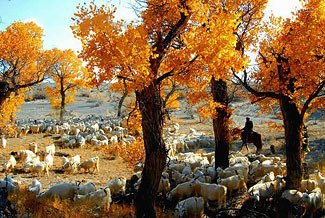 Luntai County, is located in the south of Tianshan Mountain; the north rim of the Tarim Basin, here is the world's largest, the densest, the best existing “tertiary living fossil”, that is, more than 27,000 hectares of natural poplar forest. Poplar forest in Tarim River Basin is a typical desert forest meadow vegetation types, distribute from upstream to downstream river valley. Although poplar forest structure is relatively simple, it has a strong zonality ecological characteristic. 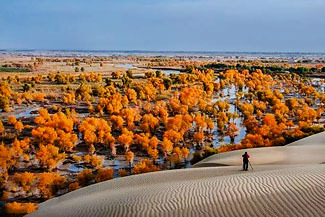 Populus Euphratica Park is located in the core position of the Tarim Poplar Protect Reserve, across the middle of the Tarim River, opened in 1997. Turpan: Also known as Turfan or Tulufan, is a prefecture-level city located in the east of Xinjiang, China. It has an area of 26,766 sq mi and a population of 570,000 (2003). 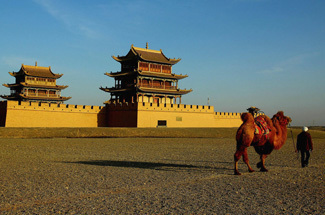 It is an important trade center located along the Silk Road. 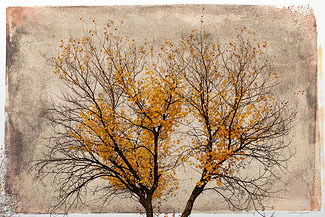 It owes its curious longevity to an ingenious irrigation system once prevalent throughout Central Asia. Here 5,000 kilometres of underground tunnels channel glacier water from the high mountains down to the valley, sustaining a population of over 250,000 people and the grapes for which the area is famed.Surrounding the town are numerous fascinating sites including ruined desert cities, ancient Buddhist caves, and Jiaohe Ruins, World heritage of history, ancient remains in the middle of desert. 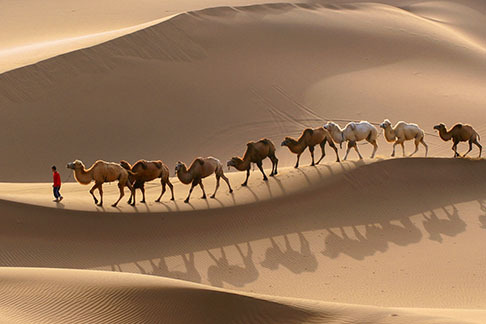 We are going to visit the Mount Sand Park which is located at Kumtag Desert in Shanshan county,taking photos of a row of camels crossing the desert. Kumtag desert has been developed as a tourist resort where visitors can have a full view of the magnificence of the desert without actually venturing out into it. Su’s Note: I took a similar route to Xinjiang in 2016 in the same season. There were a lot of photo opportunities, such as the unique White Sand Lake, Populus Park and so on. Especially, when I visited the bazaars, the old towns, and stopped on the roads. It was the first time to see the Xinjiang people making and baking the Nan bread (Xinjiang pizza), witness how they roasted lamb, and how they used their special way of bargaining in the markets. I saw from time to time a large drying red peppers, looking like the red “sea”, but I also often saw a large white cotton field. The sheep in Populus forest shuttle, also ran on the road sharing the space with me. I found the fruit in Xinjiang were very sweet and juicy, the “BBQ” lambs were very tasty and inexpensive. There were many check points on the road, and when I checked in hotels, my luggage needed to be gone through the X-ray machine. I saw armed police on guard at every block of streets, and I felt very safe. Xinjiang is located Northwest China, it uses its own time zone, which is two hours later than Beijing time. 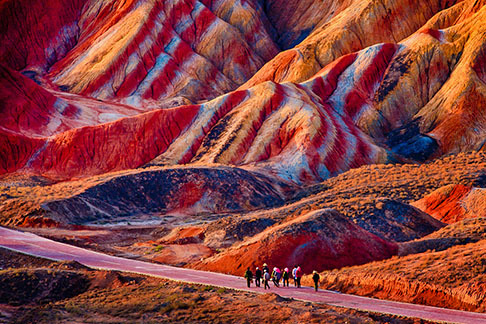 Zhangye, is a prefecture-level city in central Gansu Province in China. 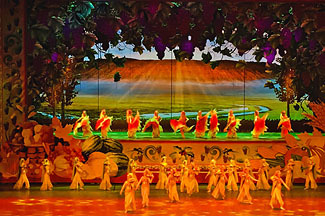 It borders inner Mongolia on the north and Qinghai on the south, midway through Hexi Corridor. Its central district is Ganzhou, formerly a city of the Western Xia and one of the most important outposts of western China. Population:4.46 million, total area: 16,177 sq mi. 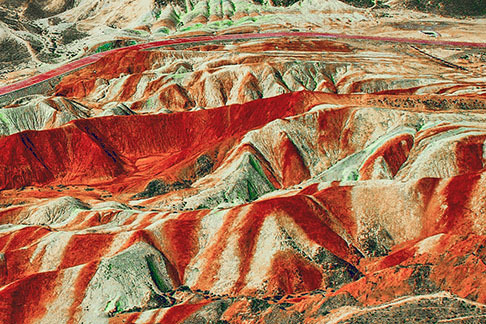 The Zhangye National Geopark is located in Sunan and Linze counties within Zhangye. 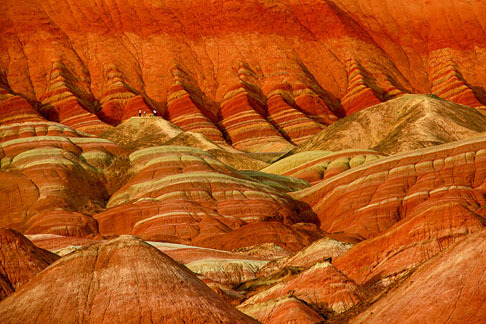 It covers an area of 124 sq mi known for its unusual colorful rock formations which are smooth, sharp and several hundred meters tall. It is the result of deposits of sandstone and other minerals that occurred over 24 million years. It has been voted by Chinese media outlets as one of the most beautiful landforms in China, and listed as UNESCO World Heritage Site in 2009. 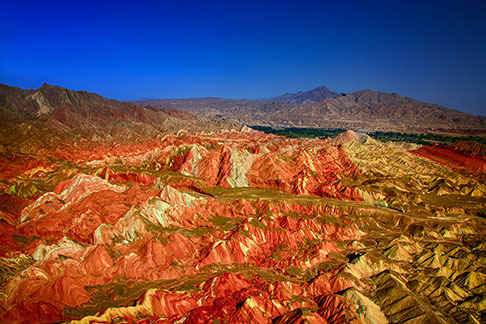 The core area of the park, Linze Danxia Scenic Area, is located 19 mi west of downtown Zhangye. It is the most developed and most visited part of the park. There are four sightseeing platform having been built on the top of some higher mountains. Travelers need to hike up some uprising winding stone steps to get to the top of the platform. Traveler can ake the park bus to transfer between sightseeing platforms. A second scenic area, Binggou, located on the north bank of Liyuan River, was officially inaugurated on 3 August 2014. Binggou covers an area of 120 sq mi, and its elevation ranges from 1,500 to 2,500 meters above sea level. 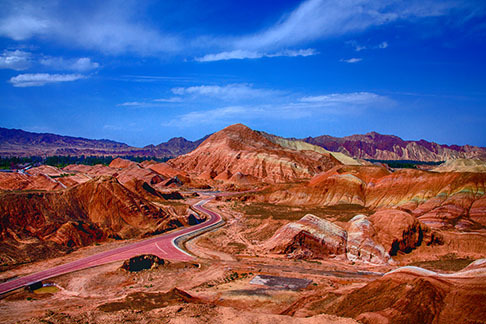 A third area, Sunan Danxia Scenic Area, is located in Ganjun, south of Linze. Jiayuguan is a prefecture-level city in northwestern Gansu province, with a population of 231,853 as of 2010. 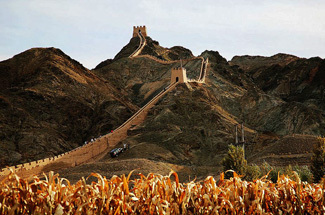 It is most famous for the nearby Jiayu Pass, the largest and most intact pass of the Great Wall of China. Jiayu Pass is standing at the western end of the Ming Dynasty Great Wall. Different from the well-known sections built with stones or bricks, Jiayuguan Great Wall was built with rammed earth, making yellow its dominant hue and helping the pass blend harmoniously with the surrounding desert. 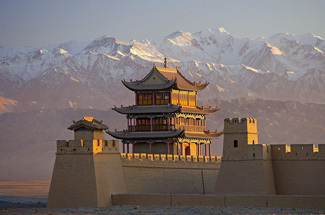 The city where the pass is located is named after the pass, also called Jiayuguan, consisted of three defense lines: an inner city, an outer city , and a moat. The pass is trapezoid-shaped with a perimeter of 2,405 ft and an area of more than 361,000 sq ft. The length of the city wall is 2,405 ft and the height is 36 ft.
Dunhuang is a county-level city in northwestern Gansu Province, Western China. 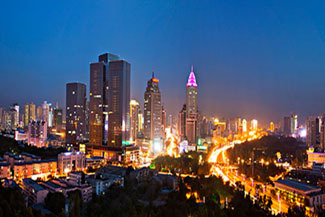 The 2000 Chinese census reported a population of 187,578 in this city. 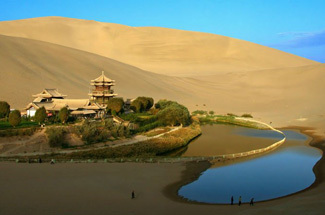 Dunhuang was a major stop on the ancient Silk Road and is best known for the nearby Mogao Caves. 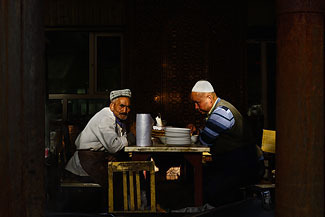 It has also been known at times as Shazhou and, in Uyghur, Dukhan. 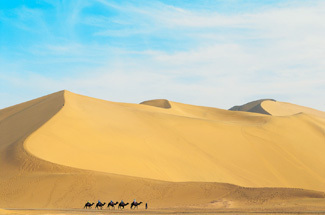 Dunhuang is situated in a oasis containing Crescent Lake and Mingsha Shan ( meaning "Singing-Sand Mountain"), named after the sound of the wind whipping off the dunes, the singing sand phenomenon. Dunhuan commands a strategic position at the crossroads of the ancient Southern Silk Route and the main road leading from India via Lhasa to Mongolia and Southern Siberia, as well as controlling the entrance to the narrow Hexi Corridor, which led straight to the heart of the north Chinese plains and the ancient capitals of Chang'an (today known as Xi'an) and Luoyang. 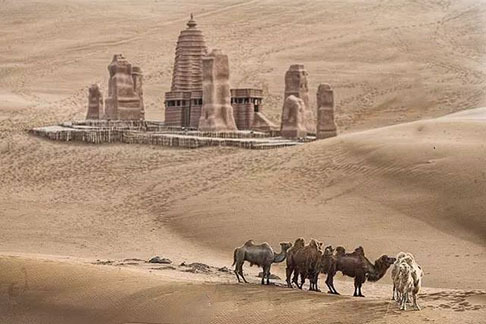 Dunhuang has a cold desert climate, with an annual total precipitation of 2.64 in, the majority of which occurs in summer; precipitation occurs only in trace amounts and quickly evaporates. Winters are long and cold, with a 24-hour average temperature of 17.1 °F in January, while summers are hot, with a July average of 76.3 °F; the annual mean is 49.1 °F. The diurnal temperature variation averages 29.0 °F annually. With monthly percent possible sunshine ranging from 69% in March to 82% in October, the city receives 3,258 hours of bright sunshine annually, making it one of the sunniest nationwide. The Mogao Caves, also known as the Thousand Buddha Grottoes or Caves of the Thousand Buddhas, form a system of 492 temples 16 mi southeast of the center of Dunhuang, an oasis strategically located at a religious and cultural crossroads on the Silk Road, in Gansu province, China. 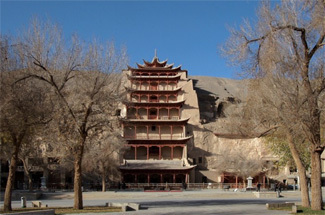 The caves may also be known as the Dunhuang Caves, however, this term is also used as a collective term to include other Buddhist cave sites in and around the Dunhuang area, such as the Western Thousand Buddha Caves, Eastern Thousand Buddha Caves, Yulin Caves, and Five Temple Caves. The caves contain some of the finest examples of Buddhist art spanning a period of 1,000 years. The first caves were dug out in 366 AD as places of Buddhist meditation and worship. The Mogao Caves are the best known of the Chinese Buddhist grottoes and, along with Longmen Grottoes and Yungang Grottoes, are one of the three famous ancient Buddhist sculptural sites of China.